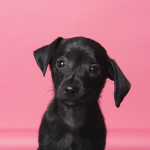 Rescue Case Stories | Portfolio Categories | Mr Bones & Co.
Luke, age 4 months as of 6/14/17, is one of three Chiweenie pups we took in after a backyard breeder left them in a municipal shelter in NC at age 6 weeks. They had been born with what our neurologist have now diagnosed as cerebellar vestibular dysfunction, a congenital issue secondary to lack of oxygen in utero. While this sounds scary, we are thrilled to share that all three puppies will need normal lives, albeit a bit clumsy with some balance issues and a general incoordination. These pups are spayed/neutered, fully vaccinated and ready to go home in NY, NJ, CT and some parts of PA. 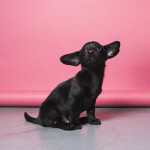 Note: While Luke has already been adopted, because of their special needs, Bo and Daisy will need to go to a home with another FRIENDLY small dog. We will also consider one home for them to be adopted together as a bonded pair. Update July 13, 2017: We have discovered Daisy is completely deaf. 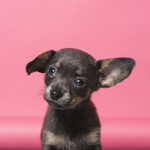 She is a happy, healthy puppy and this should not deter her adopter! She will need a home willing to work with a trainer who understands who to rain deaf dogs so that she can reach all her training milestones. We are excited to report her balance has improved significantly and her cerebellar issues are virtually unnoticeable at this point! Daisy, age 4 1/2 months as of 7/20/17, is one of three Chiweenie pups we took in after a backyard breeder left them in a municipal shelter in NC at age 6 weeks. They had been born with what our neurologist have now diagnosed as cerebellar vestibular dysfunction, a congenital issue secondary to lack of oxygen in utero. While this sounds scary, we are thrilled to share that all three puppies will need normal lives, albeit a bit clumsy with some balance issues and a general incoordination. These pups are spayed/neutered, fully vaccinated and ready to go home in NY, NJ, CT and some parts of PA.
Update July 13, 2017: We have discovered Bo is deaf in his left ear. He is a happy, healthy puppy and this should not deter his adopter! We are excited to report his balance has improved significantly and his cerebellar issues are virtually unnoticeable at this point! Bo, age 4 1/2 months as of 7/20/17, is one of three Chiweenie pups we took in after a backyard breeder left them in a municipal shelter in NC at age 6 weeks. They had been born with what our neurologist have now diagnosed as cerebellar vestibular dysfunction, a congenital issue secondary to lack of oxygen in utero. While this sounds scary, we are thrilled to share that all three puppies will need normal lives, albeit a bit clumsy with some balance issues and a general incoordination. These pups are spayed/neutered, fully vaccinated and ready to go home in NY, NJ, CT and some parts of PA.
Every day is a holiday with HOLIDAY! This affectionate girl joined us in February 2017 us from one of our NC partner shelters after she was rescued from a backyard breeder. Holiday is 2 1/2 years old and 45 lbs. Holiday loves her people and is EXCELLENT with kids – she is a wonderful family dog! She spent the first part of her life forced to have babies to be sold be her previous owner. Now that she is no longer forced to raise puppies or deal with male breeding dogs, she wants to relax and enjoy the good life of being the apple of your eye and the only pet in the home. While Holiday much prefers people to other dogs, she does best with calm, gentle dogs who are not pushy or full of puppy energy and who are respectful of other dogs. 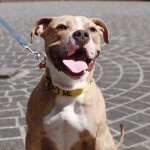 Holiday is in a loving foster home in Manhattan and working beautifully with one of our dedicated trainers. 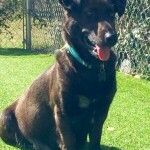 She is housetrained, obedient and well mannered and up to date on all shots, microchipped and spayed. Holiday has successfully beat severe heartworm and is fully recovered and ready to go home! She has slight heart murmur but it has been determined to be benign and will not be an issue. No cats for Holiday, please!To apply to adopt in NY, NJ, CT and PA, fill out an application at here! BLINX, a 76lb. XL 18-24 month old pup, suspected to be an American Bulldog/Dogo mix, is a true gentle giant. The person(s) who sadly cropped his ears is likely the same one who let him suffer with entropion, a painful condition where the eyelid rolls inwards causing the lashes to rub against the eyeball, which appears to have been for most of his life. This bog ‘ole derp is in excellent hands with foster mama Heather and we are excited to share that he has been accepted into The Animal Medical Center’s AMC to the Rescue program! This means they will be donating his surgery, which we expect to happen around March 10-15. MIGHTY had been waiting at the Brooklyn location of our city shelter since August 2016 by the time we learned of him in Jan. 2017. We’d met him a few times but didn’t have foster available for this tiger hunk. After one of his advocates and shelter volunteers, Jane, reached out to us, despite being quite full, we simply decided to say YES! Jane picked this patient boy up on Feb 4, 2017 and took him directly to New Hampshire where we have enrolled MIGHTY in an incredible training program at the highly regarded Gail Fisher’s All Dogs Gym. 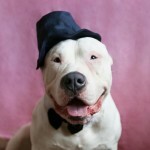 He successfully graduated from a six week training program that got him adoption ready and fully briefed on his manners and cues. His training focused on manners; sit, stay, wait at the door, walk on a loose leash, settle, come when called, no counter surfing, leave-it and other appropriate home and obedience manners exercises. Mighty is super sweet and very willing to work at all times. He is food and love motivated. He is a very kind dog and his trainers say they truly enjoyed working with him! Mighty also walks well on leash using his gentle leader, similar to a horse bridal but for dogs. NANA and her nine Peter Pan have puppies arrived, officially the newest residents of our One Lucky Pup program. We worked hard alongside one of our rescue partners, Faithful Friends Animal Sanctuary, Salisbury NC, to keep this family of TEN alive, together and ready for the life they deserve. While Nana nursed her puppies, FFAS cared for them. We flew to NC twice to visit Nana so that we could learn more about her and gain her trust so that by the third time she met us, at a private airport in NJ, she would know us. During the past ten weeks Nana’s babies were weened and every one of them survived. Nana was an incredible mother, watchful, attentive and nurturing. It was obvious she understood this litter was different. When the time came for FFAS to separate Nana from her puppies we were elated to learn Nana flourished. She played with toys for what may have been the first time, enjoyed meeting new people, discovered boundless energy to run and jump and engaged with other adult dogs without fear or hesitation. Nana had become a dog, and it was a beautiful site! Thanks to two selfless pilots from Pilots N Paws, Chris and Doug, this family of ten were flown from NC to MD then to NJ, where we loaded them into a van and began seven hours of foster and foster-to-adopt drops for homes in NJ, NY and CT. Finally having all ten dogs safely in our minivan and far away from the cruelty and neglect of their origins was a huge moment for both FFAS and Mr. Bones & Co. As the day wore on and each of Nana’s babies left her, she watched closely, sometimes pulling towards them, but ultimately allowed the transition, because she trusted and knew us. It was important to go to great lengths for Nana because of all that she endured in her life and because of the loss of both of her previous litters. At about 7PM that evening, we arrived at our last stop, Nana’s foster-to-adopt home where a wonderful couple had been eagerly awaiting her arrival for some time. We brought one of our adoptables, Buddy Love, and one of Nana’s babies, Peter Pan, along so that she could have some familiarity as she adjusted to a new home. Nana opened up, played with both puppies, eagerly met the new people who she may soon call her family and received her first brand new toys, meant just for her. It was incredible to see her play, chase, roll in the grass and prance into this new home. After an hour, we quietly slipped out of the home while her new people showered her with attention, knowing that Nana would sleep in comfort, safety and peace that night. NANA & HER PETER PAN PUPPIES – THE FULL STORY: On July 9 a female dog who had lived on a chain in a North Carolina backyard for four years gave birth to her third litter. Her first litter had no survivors. Her second litter all died as well, for the exception of one female puppy. When this puppy was old enough to be chained, she joined her mother in the backyard, pregnant by the time she was six months. They could see each other, but never touch. Neighbors watched the home and witnessed many acts of abuse and neglect. The owner allowed the neighbors to feed his dogs and arrange for a rabies vaccination. They built a small doghouse so the dog didn’t have to sit in the hot Southern sun all day. They witnessed acts of abuse from adults and children in the home and called animal control multiple times, each time being told there was nothing that could be done. On July 10 the man and his family announced they were moving away, leaving the adult female and her daughter chained in their backyard. He posted sad photos of the litter on Facebook and announced anyone could have them. The neighbors who had been advocating for this dog for four long, heartbreaking years jumped into action. Because the man had chained her up, she could not reach her crying babies to nurse them. They removed her chains and her older daughter’s chains and took them all to safety. One of these neighbors adopted the older daughter immediately and will raise her with her own family. They contacted Faithful Friends Animal Sanctuary, Salisbury NC who agreed to take in the others. FFAS then called Mr. Bones & Co., asking if we could help, and we jumped in as well, completing this incredible community rescue. After four long years of suffering, this dog is safe. Her final litter will survive. In early September, once her babies are weened, healthy and stabilized by the team at FFAS, we will transport this family to NYC and count TEN new additions to our One Lucky Pup rescue, rehabilitation and adoption program. To honor a very good mother who is incredibly sweet and gentle despite years of abuse and neglect, we named her NANA, after the caring Newfoundland who looked after the Darling children in the Peter Pan story. Her nine puppies are Tinkerbell, Tiger Lily, Jane, Wendy, John, Michael, Liza, Curly and of course, Peter Pan. Special thanks to Nana’s angels, her neighbors for never giving up, and to Mary Padavick, for saying yes, and then bringing Mr. Bones & Co. on board for phase two of this incredible rescue story. Stay tuned for more updates as this family grows and begins their epic journey North! Lucy, estimated to be about two years old, is a 40lb. cat and dog friendly Collie/Lab/Basset mix. The daddy of her babies is a pocket-sized Pit Bull that sadly, we were unable to take in. Lucy is up to date on vaccinations and will be spayed once her milk dries up. As of publication, her litter as been weened and everyone, including mama, is in excellent health! 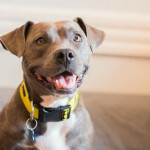 NEW YORK, NY: Luna, dog and people friendly, is ready to be adopted! This 5-year-old, petite 30 lb. 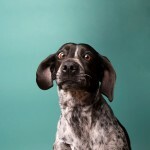 German Short Haired Pointer/Beagle mix with adorable wonky eyes has been calling Brooklyn, NY her temporary home with foster parents Sten and Sophie (of Sophie Gamand Photography) while she awaits someone special to call her very own. Luna is spayed, UTD on vaccinations and working on her house training after spending her entire life living outside, tethered to a dog house with her mom, our senior adoptable Beagle, Stella. We pulled both mother and daughter together from our city’s open-intake kill shelter. Luna underwent surgery to remove two rotten teeth and is full recovered, and doing great! 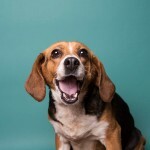 New York, NY – April 25, 2016: Stella, an 8-year-old Beagle, was abandoned by her owner at the Staten Island, NY city shelter, an open-intake kill shelter. She had lived her entire life outside, confined to a doghouse in her small backyard, bred multiple times. She was suffering from large, painful mammary tumors and a likely hernia, among other issues stemming from a lifetime of neglect. When we found out she had been abandoned along with her adult daughter, 5-year-old Luna, we couldn’t leave her behind and so we pulled her as well. Both dogs are incredibly sweet and affectionate. Stella is being treated for her tumors and hernia and will undergo surgery shortly. To adopt this senior seetie, please fill out our adoption application at here or email elli@mrbonesandco.org with any questions. Adoptions available in NY, NJ, CT, PA, MD, MA and VT.